Grinning as he called, “Tickets! 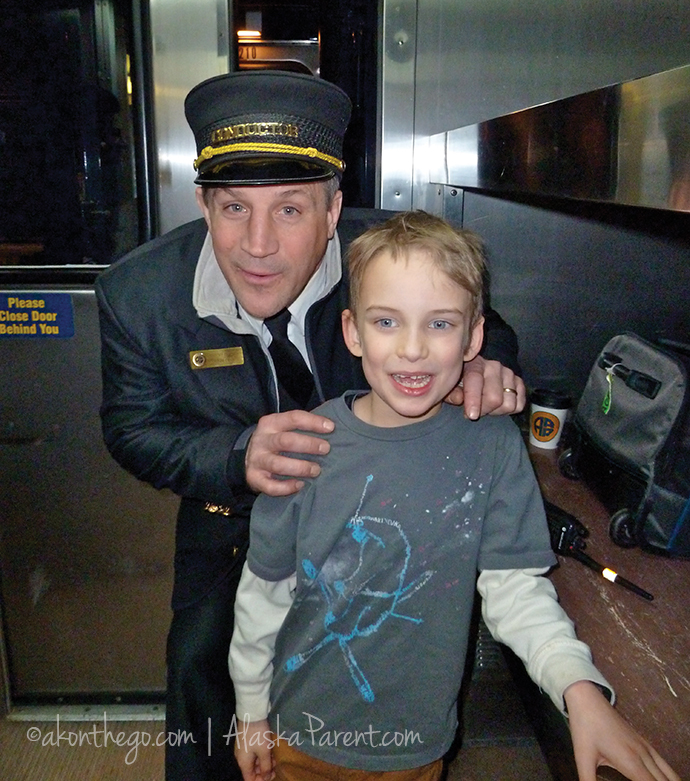 Tickets, please!” a friendly Alaska Railroad conductor punched holiday shapes in ours as the blue-and-yellow engine churned through glistening drifts of a recent snowfall. The Polar Express? Hardly, but the seasonal Aurora Winter Train captures the magic of train travel across a frozen wonderland and into imaginations of young and young-at-heart. Services aboard the train include a full dining car with bar, forward-facing seats (a few sections with tables seating four), and bag storage. Two checked and one carry-on per passenger are allowed. Passengers are welcome to bring their own snacks and drinks. 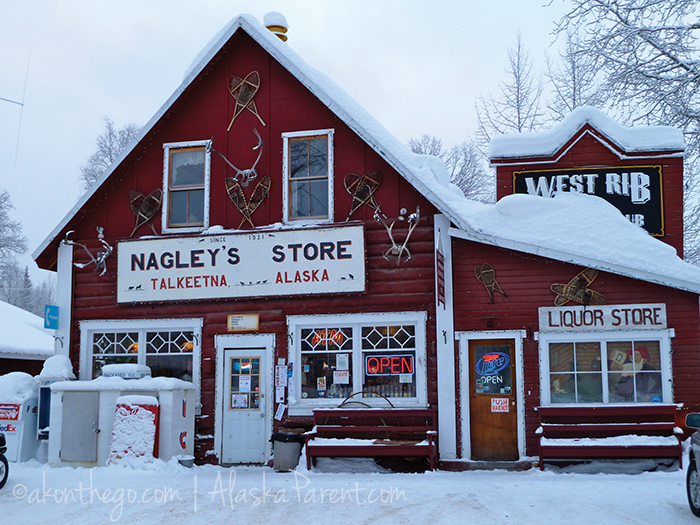 Lodging options include the historic Talkeetna Roadhouse (talkeetnaroadhouse.com), for simple, homey accommodations. Susitna River Lodge (susitnariverlodge.com) offers individual cabins with kitchens and lofts, and makes a great group destination. For small families, the Hale Kolea cabin, (halekoleacabin.com) located across the railroad tracks, is a cozy, Hawaiian-themed log cabin with modern style. Boasting a full kitchen and its own sauna, the cabin is a retreat for busy families who want a place of tranquility after a day outdoors, but is a bit of a walk from downtown. Dining in Talkeetna ranges from giant cinnamon rolls and sourdough flapjacks at Talkeetna Roadhouse to hand-tossed pizzas at Mountain High Pizza Pie (pizzapietalkeetna.com). The Denali Brewing Company is open year-round, and its accompanying restaurant, Twister Creek (denalibrewingcompany.com) serves delicious burgers and fries paired with local brews and root beer. Activities range from snowshoeing and Nordic skiing to enjoying cultural events sponsored by the active Talkeetna Chamber of Commerce (talkeetnachamber.org). During the holiday season, kids are welcomed to the Talkeetna Roadhouse for cookie-decorating, and New Year’s Eve brings a community-wide celebration with fireworks, family-style suppers and a big bonfire. Visit the Talkeetna Historical Society Museum just off Main Street (talkeetnahistoricalsociety.com), with excellent exhibits about the history of Talkeetna and the dangerous business of mountain climbing, since Talkeetna is the check-in site for climbers attempting to summit Mount McKinley. The state-operated Alaska Railroad shuttles thousands of passengers May to September from Anchorage, Fairbanks, and Seward, a distance of roughly 500 miles. Come winter, however, only the Anchorage to Fairbanks run is available, and only weekly, traveling north on Saturday morning and returning south Sunday night. Serving remote homesteads of the northern route, the Aurora Winter Train also supports the last “flag stop” route in the United States, and lucky passengers experience the glimpse of off-grid life as cabin owners ski, hike or snow machine from backwoods to civilization with the signature flick of a white flag. The entire journey between Anchorage to Fairbanks can take up to 12 hours, but a popular trip with our family is the three-hour run between Anchorage and Talkeetna, gateway to beautiful Mount McKinley. 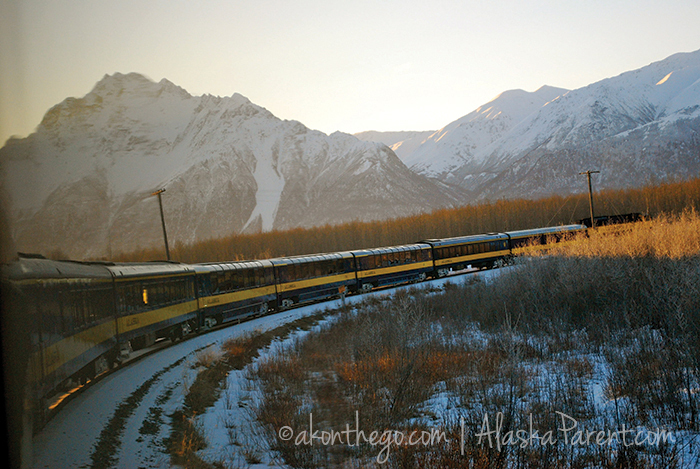 Long enough to capture the essence of train travel, but short enough for even young children, the trip affords excellent opportunities to view Alaska from enormous windows instead of the backseat of a car. Unsure about winter driving? The train powers on despite rain, snow, sleet and gloom of night, and is seldom thwarted, save for occasional browsing moose. Casey Ressler, marketing manager for the Mat-Su Convention and Visitors Bureau, says the Aurora Winter Train is a win-win for families. Three hours also gives families the luxury of downtime, a rare commodity in our busy lives. We always board the train with bags full of snacks and games, miles melting away as our family recharges together. The onboard Wilderness Cafe offers breakfast from departure time until 10:30 am; lunch and dinner are served from 11 am. Items like scrambled eggs, reindeer sausage, or burgers and penne pasta satisfy hungry kids, with salads, smoked salmon and adult beverages available for mom and dad. Talkeetna boasts around 900 year-round residents, and the community cheerfully obliges visitors who arrive via the train, albeit with a few Alaska-themed twists. The “summer” depot, closed in September when Princess Cruises shutters for the season, relocates about a quarter-mile north to the Talkeetna Section House, improvising a “winter” depot cluttered with machine parts, belching radios, and passengers who jockey for seating in the building’s two chairs. Downtown is a block from the section house, so family fun is never far in this walkable village. Trisha Costello, longtime Talkeetna resident and owner of the Talkeetna Roadhouse, says winter in town is accessible and affordable for families. Travel aboard the Aurora Winter Train provides nearly an entire weekend to explore winter’s bounty of outdoor space. At night, the aurora borealis lights up the northeastern sky, and on a clear day, Mount McKinley’s massive form takes up the entire northern horizon. When it’s time to go home, after the lights are lit on Talkeetna’s town square holiday tree, and the cold, still air makes every sound sharper, you can hear the Aurora Winter Train approaching. The horn blows clear and sharp as Alaska’s iron horse screeches to a stop in front of the section house. And we’re bound for home.